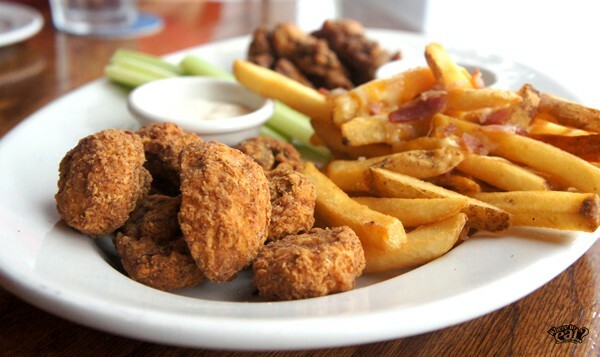 Outback Steakhouse specializes in steaks but also offers a variety of chicken, seafood and pasta dishes. With over a decade of quality food, service and ambience, it is no doubt the restaurant, situated at Millenia Walk, is highly patronized by many locals and expatriates. We were warmly greeted by friendly staffs who invited us to sit by the bar. 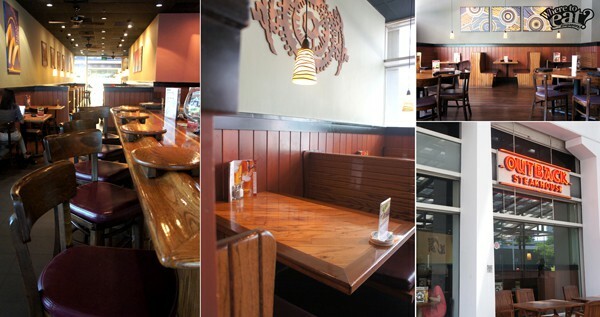 However, we chose a seat near the windows instead as it would be revitalizing to have sunlight shine down on our tables. 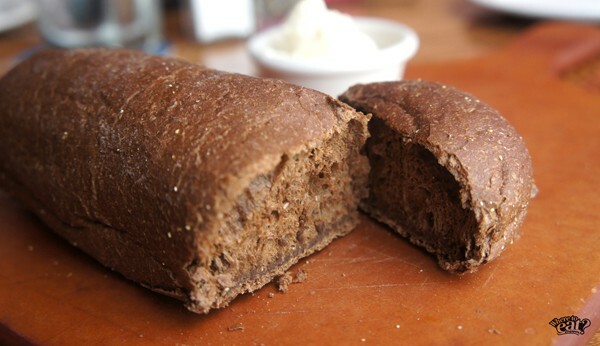 Served almost immediately as soon as we settled down was complimentary Bushman bread and butter to share. The bread was perfectly soft on the inside while the butter spread was surprisingly unheavy. I learned later that the butter had been heated to melt and remade with whipped cream to achieve lightness and fluff. No wonder my companions and I could not tell if it was butter or cream because it is both. We had the Combination Appetizer ($25.90) which is a medley of Aussie Cheese Fries, Crispy Fried Mushrooms, and Kookaburra Wings. Served along were blue cheese sauce which was slightly sourish but to my liking, and ranch sauce which in our opinion was absolutely wonderful, bright and smooth. 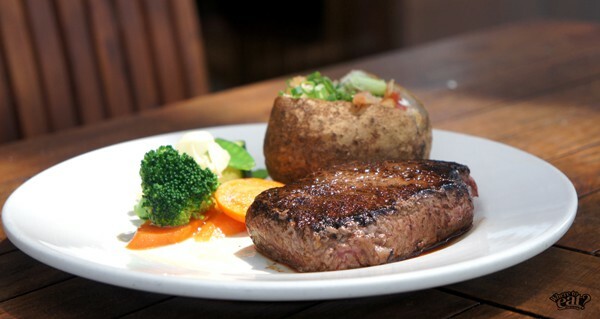 Our first main course, Outback Special ($28.90), is an 8oz signature sirloin steak seasoned and seared with bold pepper spices then served medium done. With it were two side dishes that include mixed vegetables and a generous chunk of warm cheddar bacon baked potato. 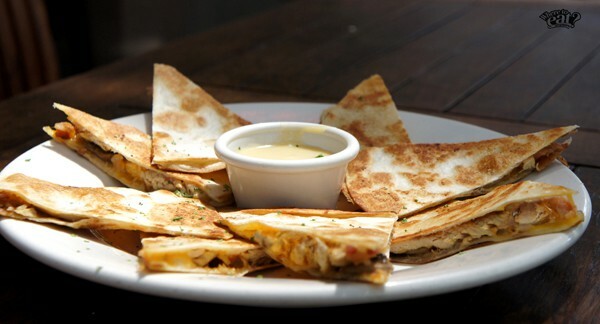 We also had one of their newer, more popular food item, Alice Springs Chicken Quesadilla (Full $17.90/ Half $11.90), which is a mixture of grilled chicken breast, sauteed mushrooms, bacon and melted cheeses sandwiched between two thin and crisp tortilla toasts – tastes great and ideal to enjoy alone or share. 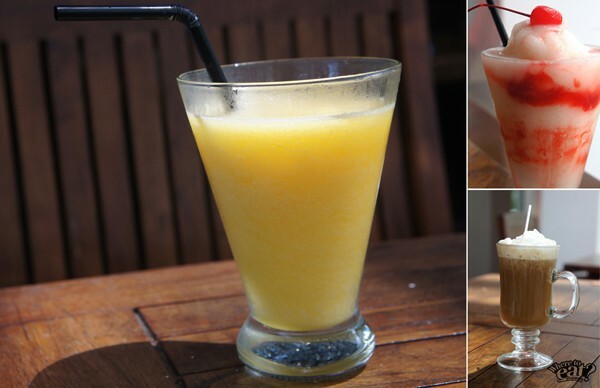 Apart from the amazing variety of quality food served, Outback also has an entire menu of signature drinks that can only be found at their outlet. Let me share a few with you. Our first spirit free drink – before the alcoholic ones were served – was Coco-Berry Smoothie ($6.90) which is a frosty blend of creamy coconut, strawberry puree and ice. More popular among women customers is The Wallaby Darned ($14.90), which combines sparkling wine and vodka along with mango and peach flavours. 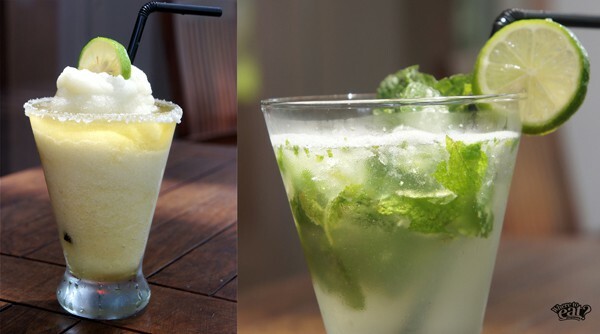 The fruity drink sends off fresh, clean and citrusy notes that is quite cooling on a hot afternoon. My personal favourite was their Cafe Outback ($10.90) which has just the right amount of Baileys and Grand Marnier that does not overpower the freshly brewed coffee. Slightly chocolatey with dark creme de cacao and complete with homemade whipped cream, do indulge but be sure not to leave any traces of guilt. A staff also had us try Gold Coast’Rita ($14.90), a blend of traditional Jose Cuervo Gold margarita and ice, finished with a salted rim. I recently read an article that said real men should never drink margarita, but I say real men should be liberal enough to really try this cocktail in disguise. Finally, we had Caribbean Mojito ($12.90) which takes a unique twist on traditional mojitos. Also popular among women customers, the refreshing concoction of Bacardi Limon, fresh lime and mint tapped with Sprite is enough to keep your spirits up for the remaining hours in your day. Overall, Outback Steakhouse has proved conscientious in crafting great drinks, cooking fabulous food and providing quality service. If you work around the Marina district area and seek for a place that serves adventurous drinks which can impress your business partner or date, be sure to consider the “outback” restaurant.